By any ones standards Bodi (formerly Alexipharmic) has walked some rough roads as of late. Amidst the challenges he has faced, there have also been some very stand out amazing moments. Basically the last year for him has had many taunting ups and downs like a game of whack-a-mole. In 2012 he has emerged like a light through the darkness. He is humbled, stronger and very focused. During last year or so Bodi lost a few people including his former tour mate Mike “Eyedea” Larson, his dog, two other friends and both Grandparents. He also did over 70 shows, put out some bangin music and volunteered much of his summer at the Ebenezer and Faraja Orphanages in Kenya. Another notable accomplishment was partnering his record/merch label Elephant Memories with global relief efforts. Fifty percent of these proceeds go directly to the global charity organization Mercy Corps and 100% of his brand new project’s proceeds go to the Ebenezer and Faraja Orphanages. All of these events recently culminated in the release of the 8 track Ep Forever Is Now. Even though personal tragedy was definitely an influence in this project this is no bum out, pity party album, it’s quite the opposite. It has the feel of a celebration of life instead of the obvious sadness of when it ends. The contributors to the project come together seamlessly. Bodi flows prolifically over bouncy, spacey tracks produced masterfully by the U.K.’s own Abstrakt. With a few subtle samples from Icelandic rock group Sigur Ros, Abstrakt blends the two styles into an ethereal sound. 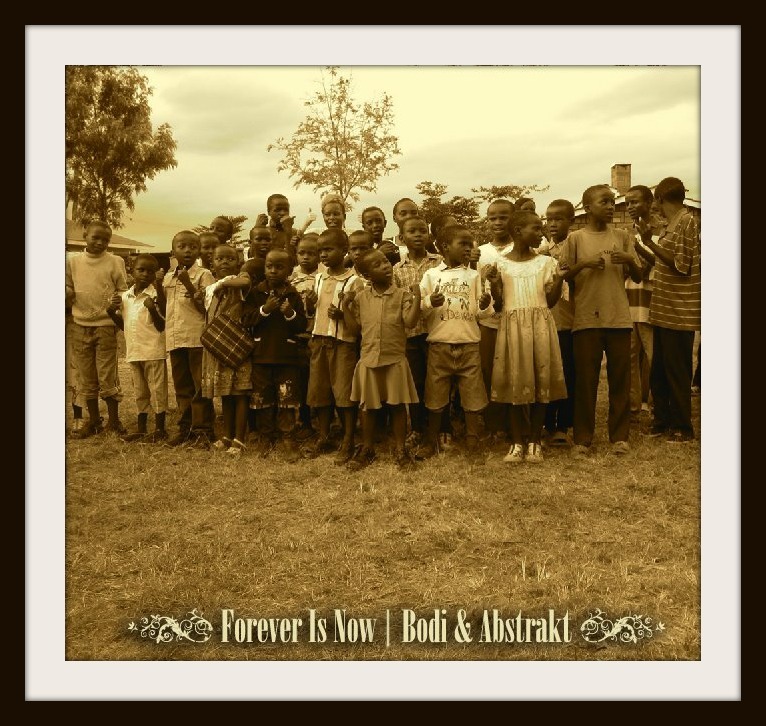 Guardian angels and life lessons provide the inspiration and the children of Kenya grace the cover. This is an amazing body of work coupled with an amazing cause. This is a soundtrack of life and food for the soul. It pumps sonic satisfaction through your speakers and bleeds audible affection to your senses. To get a little insight on who Bodi is, I had to include this track Simple Man from a previous project.